Nuffield Netherlands is very proud of all six 2017 Dutch Nuffield Scholars: Roland van Asten, Marten Dijkstra, Jaco de Groot, Jaap Dun, Rick Baats and Erik Stegink. This year, for the first time a Dutch Scholar joined a GFP. In 2017 there will be five scholars who will get that great experience as well. Being chairman of Nuffield Netherlands, Djûke was invited by Rabobank to be in the discussion panel at the Farm to Fork summit in Sydney and join the Global Farmers Master Class. 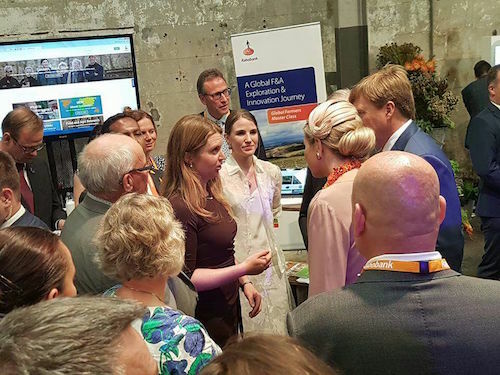 She had the honour to speak to the Dutch king and queen during the Farm to Fork summit (left). And see below a photo of our latest Scholar, Rick Baats. 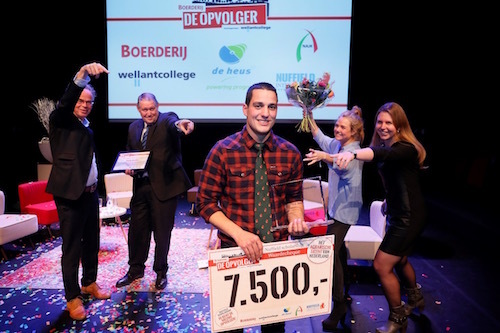 He is the winner of the Dutch Apprentice at the beginning of this month. Rick had to complete many assignments about farming, entrepreneurship, innovation and more and he has done a great job.